In the fall of 2015 we released a video study entitled: "The Coming Global Auto Abyss - Too Much Supply, Too Many Brands; Combine with Too Much Credit!". We concluded that low interest rate monetary policy for the auto industry was like handing crack cocaine to a drug addict. The auto industry would rapidly and irresponsibly abuse it, to such an extent that it would once again 'spin out' and careen back to what can only be termed the Washington 'substance abuse center'. Whether mis-management or clever strategy we are unfortunately being proven right and are now witnessing the reality. INDUSTRY CULTURE: Sustained periods of cheap credit unintentionally changes buying behavior patterns, expectations and financing structures of industries. During Ford Motor company's latest earnings call, while defensively attempting to justify a massive 50% shortfall in earnings (falling to $0.30-0.35 from $0.68 in Q1 2016 and versus expectations of $0.48), they disclosed that sales volumes are now expected to fall off this year and next with used car prices dropping for several years! How could this be with US industry sales at historic levels approaching 18M units per year and no one anywhere with any credibility, even remotely suggesting that a US recession was imminent? The answer is that 'hole' we referred to above has arrived but it is a much worse chasm because of the industry financing options that have been foisted on the unsuspecting, tapped out US buyers since the "cash-for-clunkers" slight of hand. The industry has created a minimally two year hole in the market that will flood used and new auto supply inventories while buyers are effectively locked out! This is not how a well managed industry strategically and responsibly plans, unless of course the game is actually government regulatory arbitrage (think: "Cash-for-Safety" to justify new expensive regulatory features)? Auto Leasing has exploded since 2015 and now approaches 35% of all sales. The Lease terms are normally 2-3 years with questionable residuals being used to achieve low lease rates on highly priced units. We have now entered the period where those initially leased units are being returned - in massive. 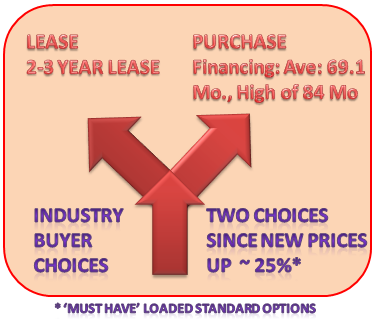 Meanwhile, those Buying versus Leasing have been financing over much longer terms. Ford detailed this with the following charts for their units sold. Vehicles prices since 2008 are dramatically higher. A $28,000 vehicle in 2008 is now $50-$55,000 and loaded down with new standard equipment features such as backup cameras, WIFI, Seat Warmers etc to justify the higher prices. Prices that can only be sold via cheap credit financing terms. It was to be an expected marketing strategy to drive profits higher while money was cheap. Vehicles were increasingly leased on 2-3 year leases with high residual values and mileage limitations. The government wanted it, the central bankers wanted it and the industry wanted it. To achieve this it meant a sustained period of cheap money and creative financing. But it comes with a price tag that must soon be paid! All of this is now hitting as Ford inadvertently warned! 1. HISTORIC SALES LEVELS: Motor vehicle sales have boomed in the years since the Great Recession. 2016: U.S. sales of new cars and trucks hit a record annual high of 17.55 million units. 2017: J.D.POWER / LMC AUTOMOTIVE: Industry consultants J.D. Power and LMC Automotive reiterated their forecast for a 0.2 percent increase in sales in 2017 to 17.6 million vehicles. 2017: MOODYS: Moody's on the other hand says it expects U.S. new vehicle sales to decline slightly to 17.4 million units in 2017. 2017: EDMUNDS: For the full year, Edmund says sales appear to be falling short of last year’s record of 17.55 million vehicles. Edmunds is looking for a 2017 total of 17.2 million vehicles amid softer consumer demand for both cars and utilities as the year progresses. 2. PEAK AUTO SALES: Moody's Investors Service said in a report that U.S. auto sales have peaked, competition to finance car loans is set to intensify and drive increased credit risk for auto lenders. 3. TRADE-IN TREADMILL: Typically, car dealers tack on an amount equal to the negative equity to a loan for the consumers' next vehicle. To keep the monthly payments stable, the new credit is for a greater length of time. Over the course of multiple trade-ins, negative equity accumulates. LENDERS = >TERMS: Lenders have supported automotive credit growth with "accommodative financing," including longer loan terms, Lenders could further lower annual percentage rates and keep extending loan terms, though the latter would increase their credit risk. MANUFACTURERS=>INCENTIVES: To ease consumers' monthly payments, auto manufacturers are subsidizing lenders or increasing incentives to reduce purchase prices, though either action would reduce their profits. 4. LENDING CREDIT RISK: "The combination of plateauing auto sales, growing negative equity from consumers and lenders' willingness to offer flexible loan terms is a significant credit risk for lenders," Jason Grohotolski, a senior credit officer at Moody's recently told Reuters. In the first nine months of 2016, around 32 percent of U.S. vehicle trade-ins carried outstanding loans larger than the worth of the cars, a record high, according to the specialized auto website Edmunds, as cited by Moody's. • Incentives currently average 10.4% of a new-vehicle’s MSRP, which is the highest percentage since March 2009 when rebates averaged 11.3% during the Great Recession. • SUVs and pickup trucks—with a combined market share of 61.5%—still dominate the sales mix in a market that is bolstered by rich incentives averaging $3,768 per vehicle, according to a March sales update from J.D. Power and auto forecasting partner LMC Automotive. A decline in used-car prices is a bad sign for dealerships, which typically see better returns on used vehicles versus new ones. Limited supplies have driven up prices in recent years, but analysts have warned that used vehicles would increase in number as leased vehicles are returned to dealer lots. Ally, the former finance arm of General Motors (GM), noted in a recent presentation that full-year earnings growth would fall short of expectations, citing the anticipated price drop for used cars. “We’ve seen a pretty dramatic move in 2016,” said Ally CFO Chris Halmy, adding that the downward trend is expected to continue. In the first quarter of 2017, Ally saw used-car values retreat 7%, a steeper move compared to the company’s projection for a 5% drop in 2017. Falling used-car prices are a troubling trend for manufacturers, dealers and financial services firms, including Ally and in-house lenders such as Ford (F) Credit. Some bargain hunters will be swayed by affordable used cars, thus reducing demand for new models. When sales begin to slow, automakers often ramp up discounts to attract buyers, a strategy that cuts into profits. Car Inventories Swelled to 13-Year High - highest level since 2004, a potentially troubling sign for automakers. In February, new vehicles waited in dealer inventory for an average of 74 days before a sale, the most “days to turn” since the government’s Cash for Clunkers program in 2009. Passenger cars accounted for roughly 38% of all new vehicles sold during the first two months of the year, reflecting a sharp decline. Sedans have fallen out of favor with many consumers enticed by roomy and fuel-efficient crossovers. Although manufacturers have cut production of some small cars, supplies remain at elevated levels. Caldwell noted Banks are stretching out loans to make payments more affordable for buyers, extending loan terms as high as 84 months. The average loan term in February marked an all-time high at 69.1 months, beating the previous record set in September 2016, based on Edmunds data. For the full year, sales appear to be falling short of last year’s record of 17.55 million vehicles. Edmunds is looking for a 2017 total of 17.2 million vehicles amid softer consumer demand for both cars and utilities as the year progresses. WHAT WILL WE DO WITH THIS INVENTORY? There are now approximately 265 million light vehicles registered in the US today compared to 255 million driving age people, or just over 1 car eligible driver. How many cars can we absorb, especially since useful age of vehicles has been increasing by one year every 6.7 years over the last 20 years. This is all as predictable as a drunken sailor on shore leave. We knew cheap money would be too much for auto executives to refuse and oversupply was a sure bet! So will be the industry's return to the Washington "substance abuse center". Expect the industry to be back at the government feeding trough asking for help.